Hazard: The zipper slider and pull on the jackets can detach, if pulled when the jacket is open. The detached zipper slider and pull can pose a choking hazard to young children. Incidents/Injuries: Reebok has received three reports of zipper sliders/pulls that detached. No injuries have been reported. 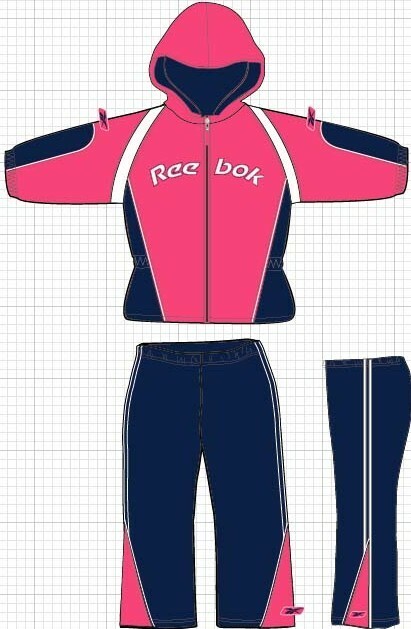 Description: The recalled jacket/pant sets were sold in royal blue, pink, pink/blue, purple/green, pink, purple, red/blue, and gray/dark gray color combinations in sizes up to children’s size 7. “Reebok” is printed across the front of the hooded jackets. The style numbers were printed on the store tag only and end in: 451, 449, 448, 447, 446, 444, 435, 433, 429, 428, 424, 412, 537, 531, 530 and 526. Sold at: The recalled jacket/pant sets were sold exclusively at Gordmans, Fred Meyer, Kids R Us, Ross, Gottschalks and Reebok Corporate Headquarters retail store in Canton, Massachusetts between August 2004 and February 2005 for between $15 and $20. All other jacket/pant sets purchased at any other retailer are not included in this recall. Remedy: Consumers should immediately take the recalled product away from young children and contact Adjmi recall hotline to receive a replacement product. Consumer Contact: For more information or to receive instructions on receiving a replacement product contact Adjmi recall hotline at (800) 873-5570.